It seems we have very short memories where two-seater roadsters are concerned. Hot off the presses, the newest sporting car can be the envy of your neighbors, yet a few years after its release, we're on to the next best thing. And while that doesn't make automakers particularly happy, it does encourage regular updates to once-loved convertibles. 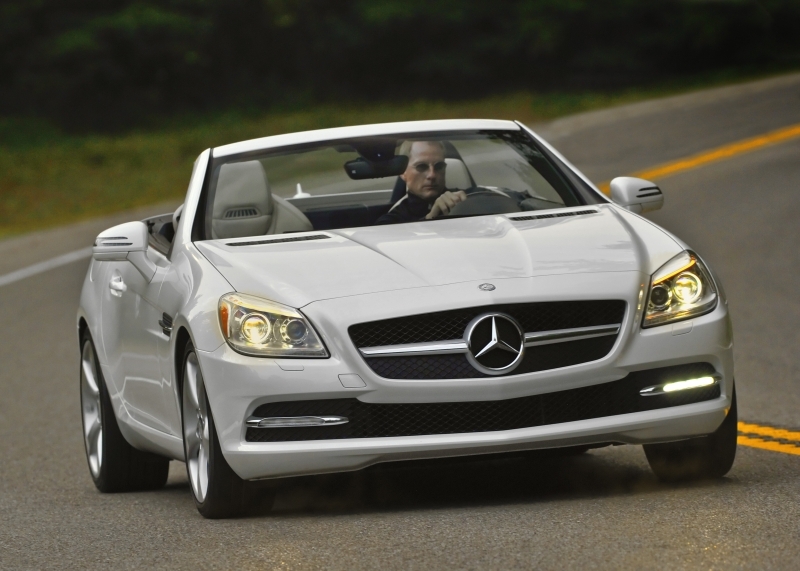 Because of this it should come as no surprise that four years after the release of the second-generation SLK, the 2012 Mercedes-Benz SLK350 has hit dealership floors. The peppy two-seater has been completely redesigned to incorporate a new SLS-inspired design language and plenty of new standard features in order to spice things up for 2012. The modifications should do the trick. The exterior design is more aggressive and modern looking than the outgoing model’s, and a few key technology options are now standard – like the luxurious Air Scarf. Putting power to the wheels is a new 3.5-liter V-6 engine that sounds fantastic and delivers enough power to make this little ride a whole lot of fun. It’s no bare-bones sports car – you’ll get that type of performance elsewhere – but the now longer and wider SLK350 is focused on providing more luxury and comfort than most in the segment. For just a slight bump in price, you’re treated to more standard features, including the hugely popular Air Scarf, a vented system that blows warm air on your neck while the top is down. Roof deployment is quick, happening in just 20 seconds. The exterior is bolder, more aggressive and reminiscent of the new SLS Gullwing design. Wind deflection is good enough that you can have a comfortable conversation while cruising at 70 with the top down. A dual-clutch transmission isn't even an option for the SLK, and it should be; the sluggish seven-speed doesn't quite hold its own. 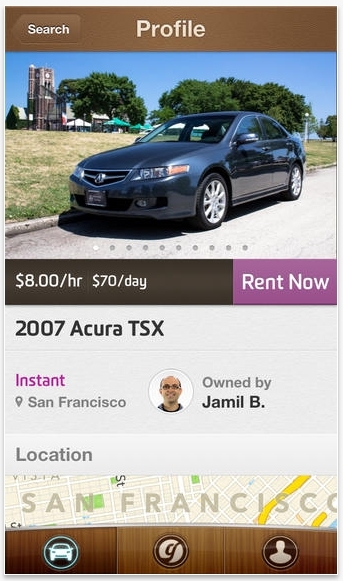 Pricing is a little high compared to the competition. The Comand system, while feature-heavy, has a confusing menu layout. As is usual with this type of vehicle, trunk space is greatly reduced with the top down. The SLK's strong suit is in its ability to create a sporty feel to its drive, despite the (heavy) luxury accoutrements it offers. 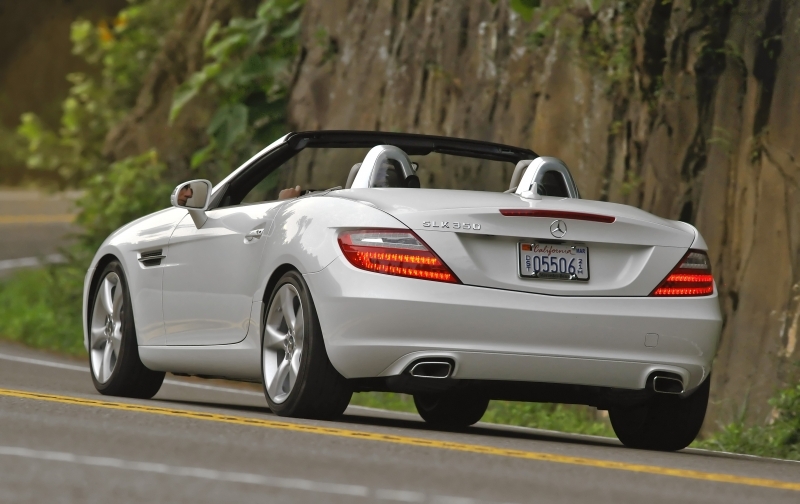 The V-6 has a near-perfect engine note that highlights the level of acceleration the SLK has on tap. As is the case with many Mercedes-Benzes, both the brake and throttle are heavy, so you’ll need a bit of a lead foot to get moving. The seven-speed transmission shifts a little sluggishly, but you have a manual shift mode with paddle shifters on the steering wheel for more hands-on fun, or you can hold out for the manual available in the upcoming four-cylinder model. 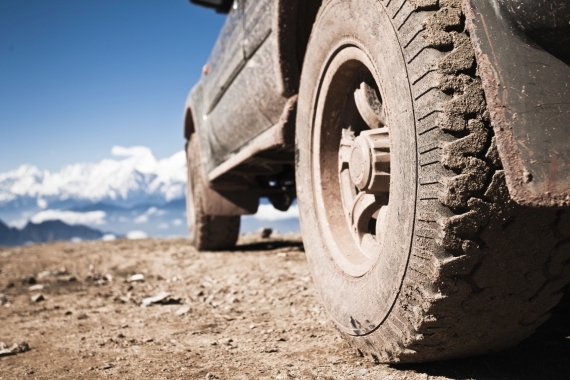 The suspension skews toward the comfort side, with damping creating a smooth ride even over bumpy roads. And the SLK is nothing if not well-grounded, especially around corners, thanks in part to strong lift-reduction aerodynamics. You’ll feel the car’s weight though, mainly in spirited driving, since the level of amenities and safety features in this small car result in it being about 400 pounds heavier than a Porsche Boxster and about 70 pounds heavier than the outgoing model. However, some of those extras have enabled the SLK to reduce wind noise to nil with the top up and completely manageable sound levels with the top down. Wind disturbance in the cabin is also minimal – even at highway speeds. A new 3.5-liter V-6 engine produces 302 horsepower and 273 lb-ft of torque, better numbers than the 2011 model. There will be a turbocharged four-cylinder option available later in the year. Your only transmission choice is a seven-speed with sport and manual modes, with paddle shifters at the steering wheel. The SLK350 is rear-wheel drive. 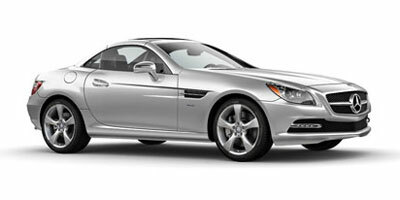 The SLK350 boasts similar fuel economy numbers to the rest of the segment and requires premium fuel. It returns 20 miles per gallon in the city and 29 miles per gallon on the highway. Expect the upcoming four-cylinder to receive a few extras mpgs. Safety is always a priority for Mercedes-Benz, so it should come as no surprise that the SLK features a host of safety systems. 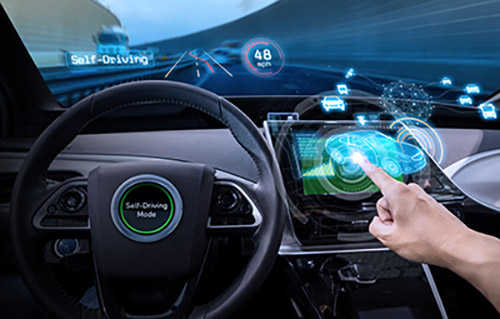 Attention Assist is standard for the first time on this car; it records erratic driver input and alerts the driver if he or she is too drowsy to drive safely. New this year is the Magic Sky Control, a optional system that with one touch of a button tints or un-tints the glass roof using electric currents, a chemical film and, of course, a few nano particles. Not only does it look cool, but when tinted it also reduces the heat level in the cabin. The popular Air Scarf feature, which vents warm air from the base of the headrest to keep you warm when the top is down, is now standard as well. Refined, in classic Mercedes-Benz fashion (and feature-heavy), the interior is spacious and comfortable. It’s dominated by the 5.9-inch central display and standard aluminum trim that can be switched out for burl walnut. The eight-speaker audio system with Bluetooth audio streaming and a USB interface is no slouch, but audiophiles will want the upgraded harman/kardon surround-sound system instead. While it has grown over time – this new generation is 1.5 inches longer and 1.5 inches wider – the SLK is still compact; more so than the BMW Z4. A few styling cues will remind the Mercedes faithful of the 1950’s SLs, and we’re most smitten with the bold rear haunches and SLS Gullwing-inspired nose. Front-facing rows of LEDs are standouts, as are the optional bi-xenon headlights they sit under. The SLK350 is most well matched against the BMW Z4 sDrive35i and pricing is within $1,500, but convertible lovers will want to look at the Porsche Boxster and Audi TT; both start at a lower price than the SLK but offer fewer amenities off the bat. The SLK350 itself begins at $54,800 (including destination fees), and thanks to minimal options and packages, the base price won’t rise much. This is no nimble performance-driven sports car, but the SLK never aims to be. It is, most importantly, fabulously fun to drive and easy to love. It’s smartly priced against its direct competitors too, especially considering the level of standard features on hand. As you’d expect, styling is up to the typically high Mercedes-Benz standards, and you’ll have a hard time not grinning as you barrel around corners in this drop-top.